We have undertaken this project in part for our own benefit, to record our intellectual pilgrimages from a young-earth creationist position to a place where we recognize that scientific observations and interpretations do not need to be accepted or rejected based on their conformity to a literal interpretation of Genesis. But we have also written for the benefit of others. We trust that this work will act a as stimulus to many who are asking how they should understand the Genesis account of creation in the light of more than 300 years of geological, biological, and astronomical data. Our goal in this effort has been to show how each of us moved from a young-earth model of natural history and a literalist interpretation of Genesis to an ancient-universe model and a historical-contextual interpretation of Genesis. We believe that the evidence preserved in the fossil record demands conclusions that are at odds with the notion that the earth is young and that life has not changed substantially over time. Although it might seem to some, especially those who are now where we began, that we are trying to undermine Christianity, this was never our purpose. We have rather sought only to refute ideas and expectations that have no basis in reality. Some of our readers may be among those who have rejected the claims of Christianity because the Bible’s cosmology appears to have no basis in reality, and who have therefore concluded that its moral and “religious” claims can also be rejected. Such people should consider, however, that if the account of creation in Genesis need not be understood as a literal description of actual processes, and need not be read with scientific expectations, then the moral message of the Bible may remain valid and applicable to everyone today, regardless of their scientific understanding. There are many questions relating to the history of life on this planet for which we have no answer. This will not invalidate most of our observations. As a scientist, I am allowed to be wrong. It is the nature of the endeavor. However, as we contemplate the young-earth creationist literature, we recognize that within their paradigm, it is not possible for them to allow that they might be wrong on any particulars. This being the case, it is also not possible to effect change, to transform their paradigm into a dynamic, learning, growing one. How can this be? Their inerrant view of their paradigm is based on a selectively literalistic interpretation of Genesis. They make the claim that their interpretation is inerrant because the Bible is also inerrant. I know this from personal experience. Young-earthers believe that their interpretation must be free of error. But this is a very risky position. If the trustworthiness of the rest of the Bible depends on speculations which cannot ultimately be vindicated, sooner or later, you will have a rather unpleasant and rude awakening. I found my back got too sore bending over backwards trying to accommodate or deny new and existing evidence, or fearing potentially condemning discoveries. I have told you here how I finally began to walk upright. Our desire is that you will be able to make an informed rational choice, not one based on emotion, lack of knowledge, or confusion. We hope that you will realize, as we have, that it’s time to stop trying to put the square peg into the round hole. “Where did I come from?” “Where am I going?” “Why am I here?” All of us ask these questions about our ultimate origin, ultimate destiny, and ultimate purpose because we seek to have meaning in our lives. Since these questions ask not just how things are, but why things are the way they are, they cannot be answered simply by observation and reasoned reflection. To answer them, we must move into the realm of faith. This book tells how its two authors initially went about answering the first question—“Where did I come from?”—through one kind of faith response: accepting and believing the teachings of one particular part of the Christian community. At the same time, they went about answering the third question—“Why am I here?”—through a different kind of faith response: stirring up the gifts that God had placed within them. At a crucial point in each of their pilgrimages of faith, they had to admit that the answers they were finding via the second route had come into hopeless conflict with those they had received by the first route. Although it felt as if they were abandoning their faith, as a step of faith they began to trust the fruits of the vocations to which God had called them, rather than the dogmatic pronouncements that had always provided such security up to that point. The end result has been to trade security for adventure in a continuing life of faith. One theme that emerges in the following pages is that supernatural results may come through what seem like “natural” processes. Several interconnected examples of this phenomenon are described in this book, but taken as a whole, it provides another example. Where cosmological affirmation and speculation failed to provide a solid grounding for a life with meaning, the slow, patient process of growing into our callings is succeeding. We’re still growing. But these are the results to date. 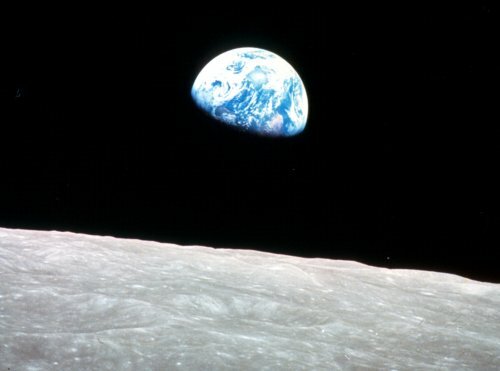 An “earth rise” above the moon, photographed by the Apollo 8 astronauts, who read from the Genesis creation account even as they carried out the most advanced in-person scientific exploration of space to that date. The controversy between evolutionary and creationist accounts of world and human origins has erupted with dependable regularity over the past several decades in churches, classrooms, school boards and legislatures across North America. At the same time, this controversy has also raged, more quietly but perhaps with more lingering and agonizing effects, within individual hearts and minds. Many believing Christians have experienced crises of faith and personal rejections when they have chosen to accept an account of origins that is based on reasoned interpretation of centuries of scientific observation, because this account does not coincide with a literal interpretation of Genesis. These crises and rejections do not have to occur. The two approaches to knowledge characteristic of faith and reason (or religion and science) can be reconciled and used in a complementary way. But unnecessary conflicts nevertheless arise because outspoken proponents of both approaches deny their inherent limitations and extended their claims into the proper realm of the other source of knowledge. This creates an “either/or” or “forced choice” situation in which one must either accept an entirely naturalistic account of origins, or else effectively deny that what our eyes see and our instruments measure is anything more than illusion. Neither of these choices will ultimately satisfy an honest intellectual inquirer. There is a middle position, however. Faith and reason are each qualified to make their own contributions to our understanding of our origins, purpose and destiny, and these contributions can be recognized as complementary. But the way to this middle position has been made perilous by the bitter polarization between proponents of “either/or” positions on both sides. The two authors of this book have traveled this way, and wish to share with their fellow travelers how they have struggled and what they have learned. The authors were both taught a young-earth, “scientific creationist” position in the Christian communities in which they were raised. This position required that the opening chapters of Genesis be interpreted literally, and it would not admit as valid any scientific discovery that did not conform to such an interpretation. But in subsequent years, as the authors pursued their respective vocations, they found it necessary repeatedly to modify and ultimately to abandon this position. In its place they have embraced understandings that are more modest, tentative and nuanced, but ultimately also more satisfying, durable and empowering. This has been the result of a process that has required years of study and reflection, and which has included times of frustration and disillusionment as well as moments of liberating insight. This book tells the story of our two journeys. In the first part of the book, Dr. Stephen Godfrey describes his field work as a descriptive paleontologist and the successive paradigm shifts that his discoveries led him through as he sought new ways to understand the evidence he was uncovering. In the second part, the Rev. Dr. Christopher Smith describes how the integration of his background and training in literary studies with his work in biblical interpretation similarly led him to move past the creationist position of his youth. The book concludes by revisiting the Genesis creation account to allow readers to see it through new eyes. After demonstrating that this account’s cosmology is indeed phenomenological (it describes how things appear, rather than how they actually are), the authors explore the implications of this demonstration for scientists and for students of the Bible. We hope that this book will be of interest and practical use those who have evangelical or fundamentalist backgrounds, who may be college students or college graduates, and who are seeking to understand how a desire to live a life of faith can be compatible with a commitment to academic inquiry. We hope that this book will also provide a useful resource within churches in such forums as adult Sunday School classes and midweek study groups, which have the time and the freedom to explore difficult and even controversial questions one piece at a time. We are not aware of any similar books that have been published in the past. We are certain that this is not because of a lack of interest on the part of readers or publishers, but rather because of a lack of authors. It is unlikely that two people in complementary vocations such as ours have traced similar pilgrimages and have been in a position to write about them together. And so we wish to share our stories with all of you. You may have heard of blog-to-book publishing. This is going to be the opposite. In 2005 we published our book Paradigms on Pilgrimage: Creationism, Paleontology, and Biblical Interpretation. It tells the stories of our two journeys as a paleontologist and pastor/biblical scholar. It recounts how we were each taught a young-earth, ‘”scientific creationist” position in our younger years and how we eventually came to embrace understandings that are more modest, tentative and nuanced, but which we ultimately have also found more satisfying, durable and empowering. This was the result of a process that required years of study and reflection, and which included times of frustration and disillusionment as well as moments of liberating insight. The book has now gone out of print and the rights have reverted to us. As a result, we are able to make the full text* available online to anyone who’s interested. We’ll be putting it out over the next several weeks in a series of blog posts of about 800-1200 words each. This will also give us the opportunity to present the photos and diagrams in digital form, and to add some new illustrations. We invite your comments and questions on each post, and we will open things up for general Q&A and discussion about religion and science, faith and reason, after the whole book appears. (Comments may be edited for length, content, and tone.) Thanks for reading along, and we look forward to interacting with you! *Because blogging is a more “popular” format, we won’t be including the footnotes from the book, which provide documentation especially for the scientific findings that Dr. Godfrey summarizes as he tells his story. If readers have questions about any of these findings, we’ll be happy to supply this documentation as part of the discussion. This blog offers an open forum for questions and answers about the Bible, natural history, and human origins, and more broadly about religion and science. But it begins with a series of posts that present the full text of our book Paradigms on Pilgrimage: Creationism, Paleontology, and Biblical Interpretation (Toronto: Clements Publishing, 2005). We encourage you to read the book as background to our journeys of faith and understanding (it starts here), and we invite you then to engage in the ongoing conversation. Thanks! Dr. Stephen J. Godfrey is Curator of Paleontology at the Calvert Marine Museum in Solomons, Maryland. The Rev. Dr. Christopher R. Smith is a biblical scholar, retired pastor, freelance writer-editor, and consultant to Bible publishers and translators. On his blog Good Question he responds to questions about the Bible. Paradigms on Pilgrimage Blog at WordPress.com.